City Baking creates delectable gourmet baked goods that you can't resist. Crafted by real bakers, all our bakery products are made in the finest bakery traditions with premium ingredients. 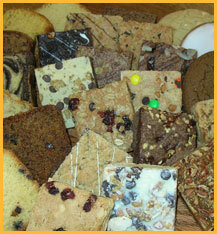 We bake our gourmet treats daily so they are fresh for you and your customers to enjoy. City Baking creates bakery treats that are perfect to satisfy your cravings for the finest baked goods. Order some delicious gourmet goodies today.